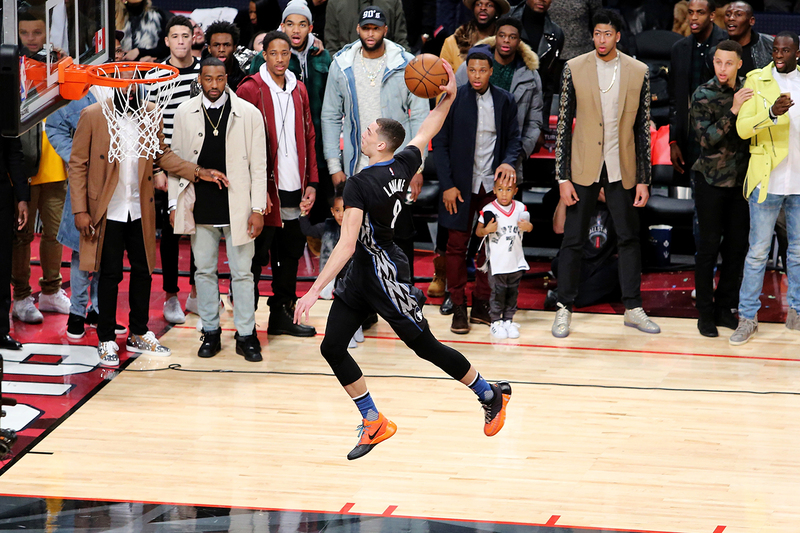 Zach LaVine became just the fourth player to win back-to-back Dunk Contests, joining Michael Jordan (1987 and 1988), Jason Richardson (2002 and 2003) and Nate Robinson (2009 and 2010). 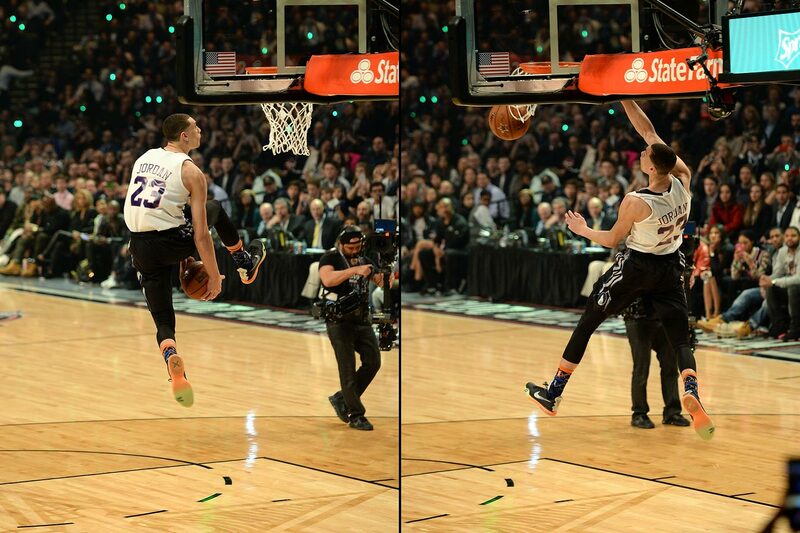 LaVine defeated Gordon in a classic contest, featuring two dunk-offs. 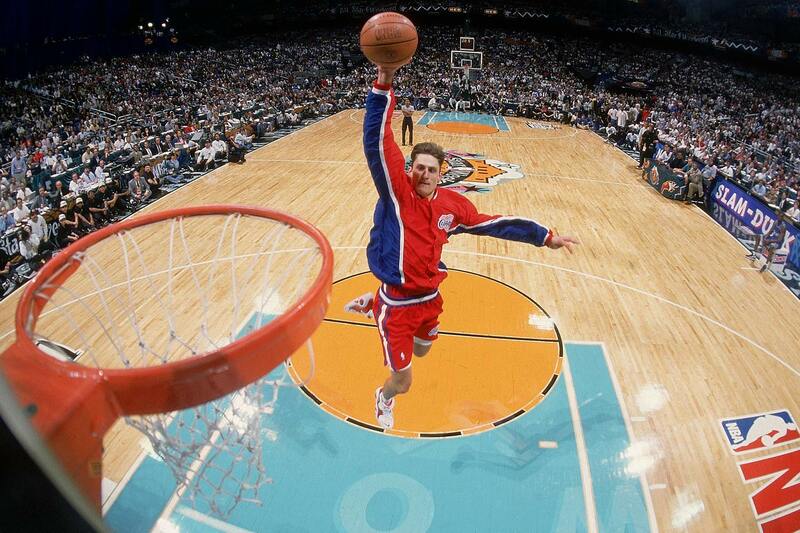 Here is every winner through all 31 of the NBA’s Slam Dunk Contests. 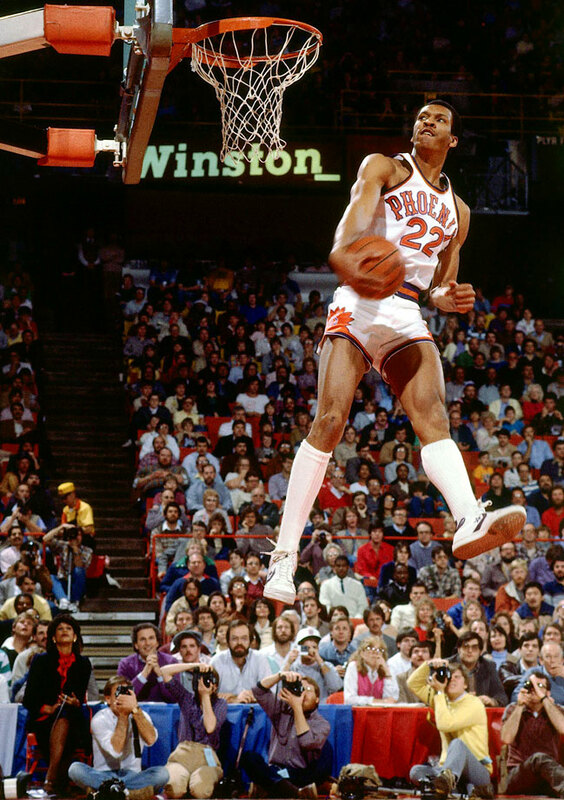 Nance bested Julius Erving and Dominique Wilkins in the NBA's first dunk contest. The nine-player field also included Darrell Griffith, Clyde Drexler and 7-foot-4 center Ralph Sampson, who finished sixth. 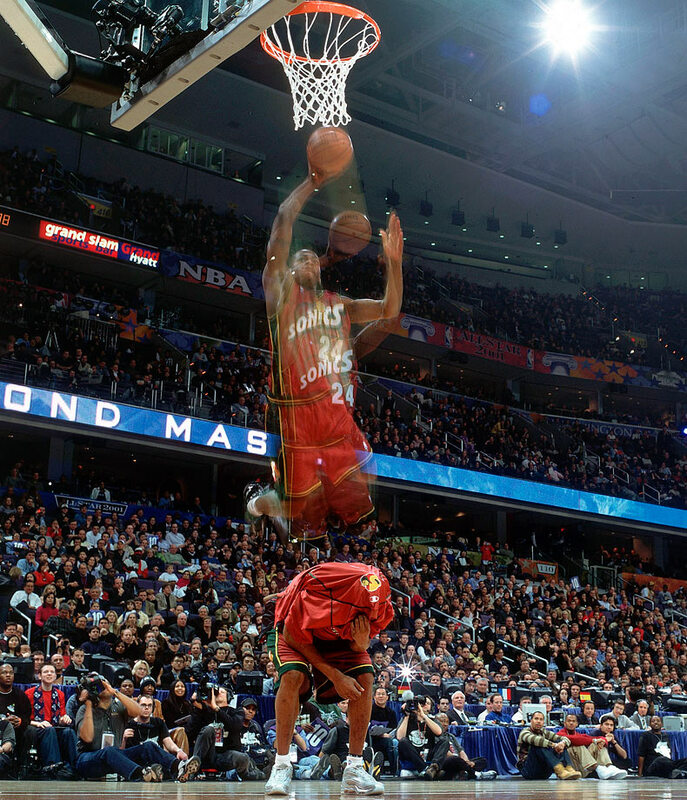 In the first of their epic duels, the Human Highlight Film beat a rookie named Michael Jordan in the finals. Delighting his hometown crowd, the 5-foot-6 guard scored perfect 50s on both of his dunks in the finals to edge Hawks teammate and defending champion Dominique Wilkins. Michael Jordan was injured and did not participate. 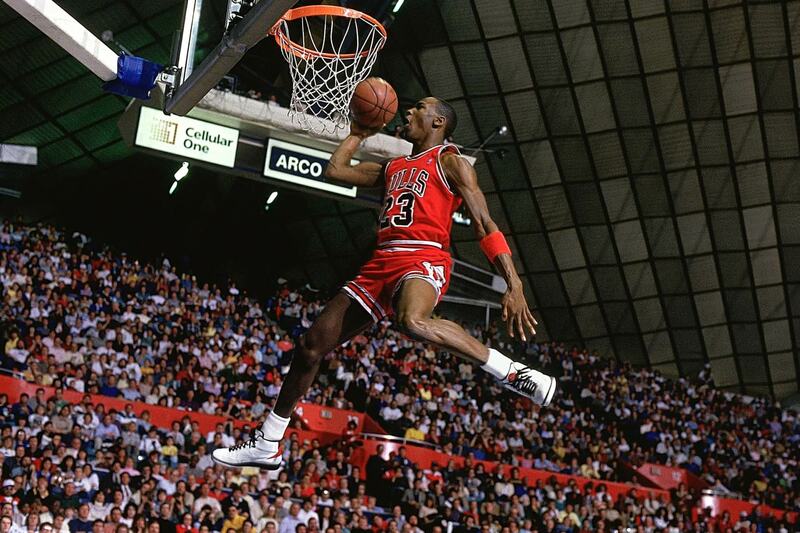 Jordan won his first dunk contest in a competition missing the previous two winners (Dominique Wilkins and Spud Webb) because of injuries. 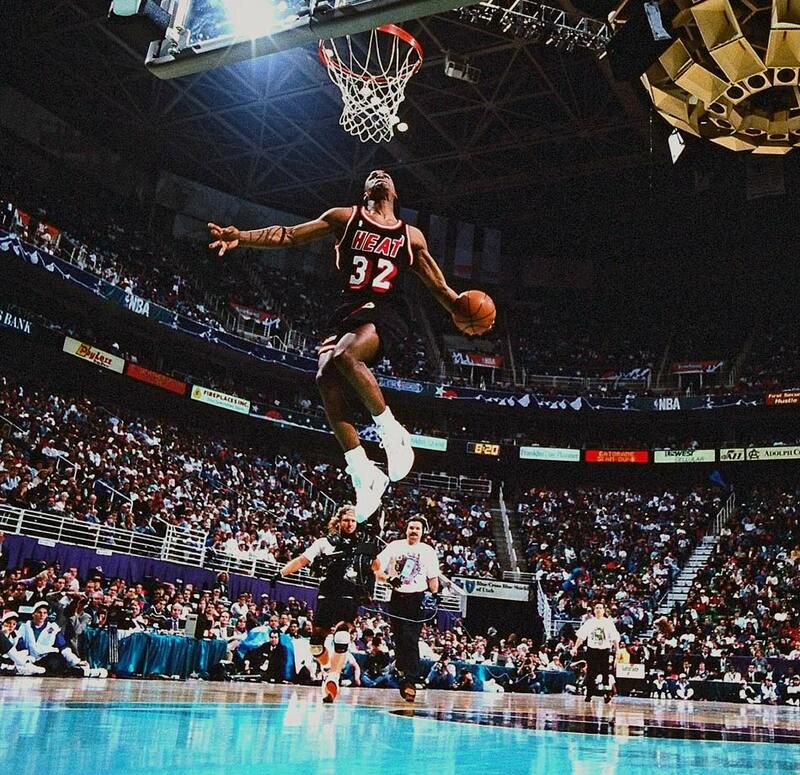 "There was adrenaline pumping through my body today that was unexplainable," Jordan told reporters after defeating Jerome Kersey in the finals. 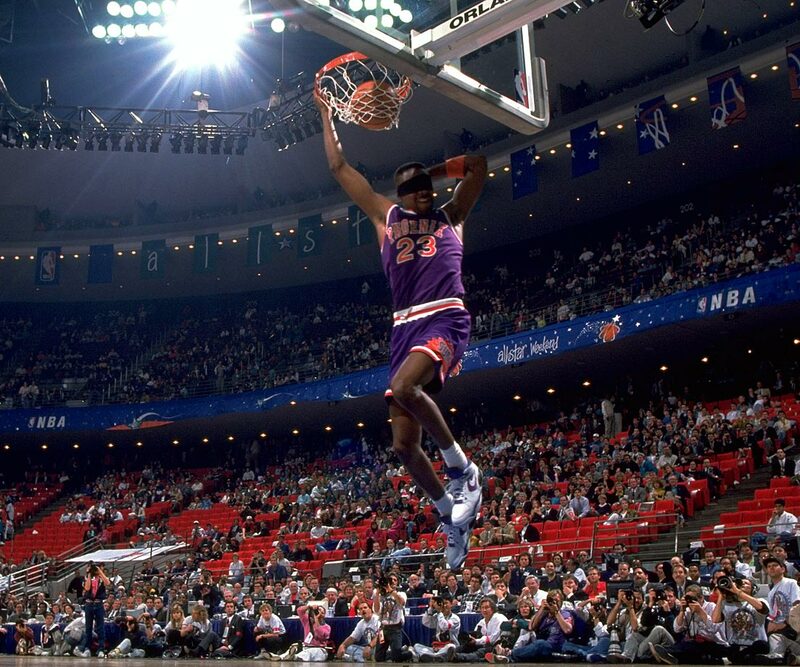 In perhaps the NBA's best dunk contest, hometown favorite Jordan edged Dominique Wilkins 147-145 in the finals to become the first repeat winner. 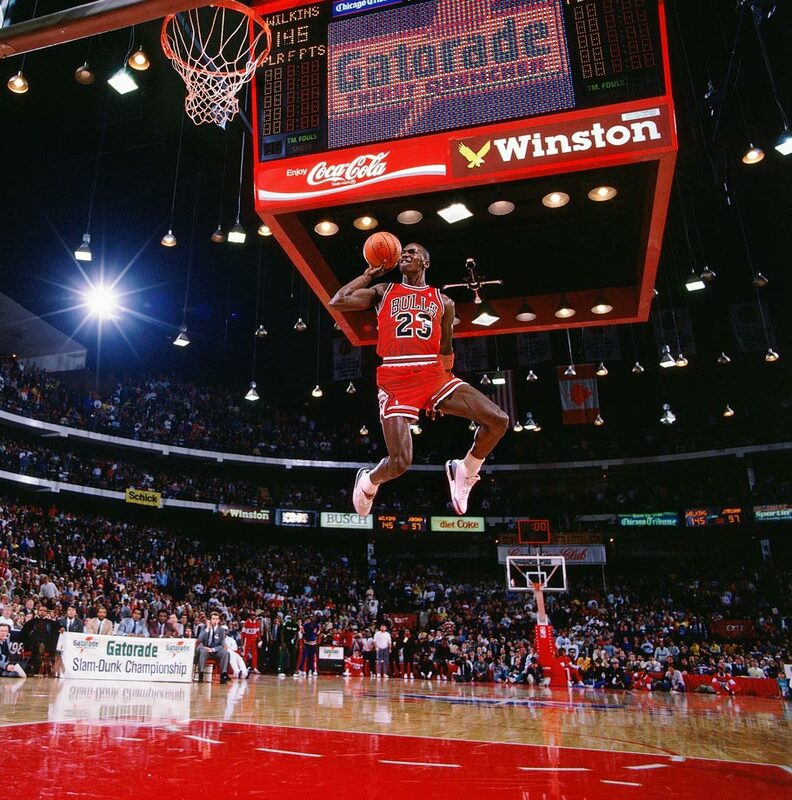 Needing a 48 on his final attempt to overtake Wilkins, Jordan scored a 50 after taking off just inside the free-throw line for a dunk. "If it wasn't in Chicago, it might have gone the other way," Jordan said afterward. 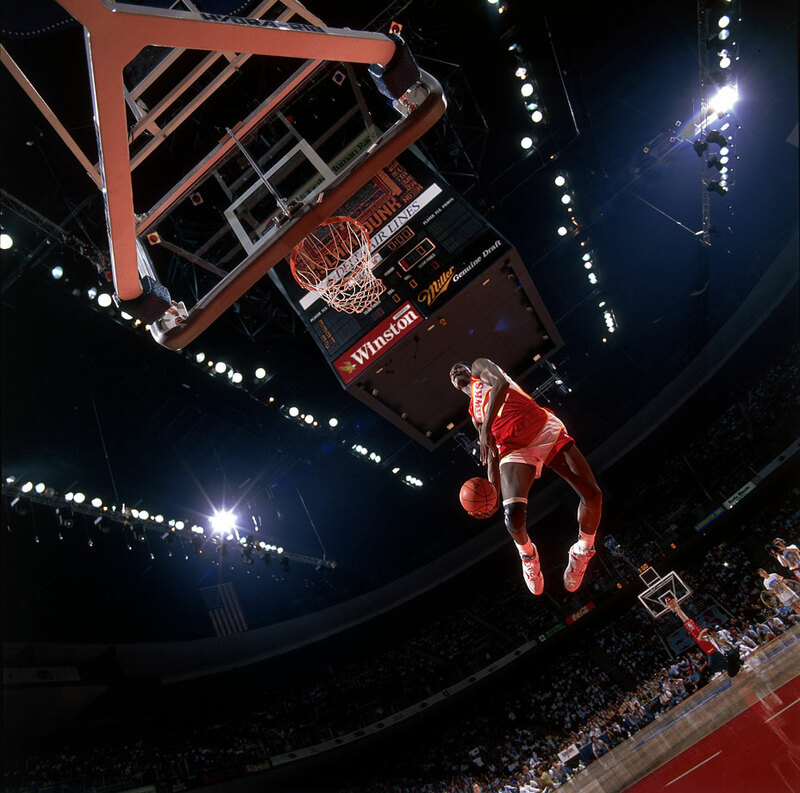 With Michael Jordan and Dominique Wilkins sitting out, "Sky" Walker filled the void with an entertaining show that overwhelmed Clyde Drexler in the finals. The Knicks forward's victory came only three days after his father died from complications from a stroke. "There was a motivation to win it for him," Walker said. `Nique beat Kenny Smith and defending champion Kenny Walker to join Michael Jordan as the only two-time winners. The 6-foot-1 Celtics rookie -- who famously pumped up his sneakers before each attempt -- clinched his victory over the more powerful Shawn Kemp with a one-handed, cover-your-eyes dunk. Having already wrapped up the title because of Larry Johnson's missed dunks in the finals, Ceballos nevertheless finished with a bang as he ran about 60 feet downcourt and completed a blindfolded slam that registered a 50. 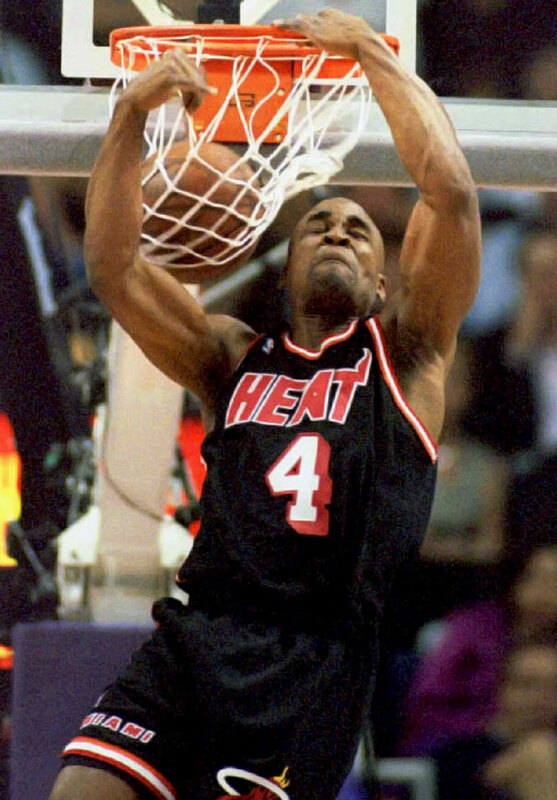 "Baby Jordan" easily topped Clarence Weatherspoon and defending champion Cedric Ceballos in what he described as the highlight of a difficult rookie season with the Heat. The Timberwolves rookie's signature move came when he drove baseline, elevated, put the ball between his legs and dunked. That was more than enough to get past Shawn Kemp and Robert Pack in the finals. Harold Miner, the 1993 winner, did not participate because of injury. Miner joined Michael Jordan and Dominique Wilkins as the only two-time winners, denying Isaiah Rider a spot in that exclusive company. 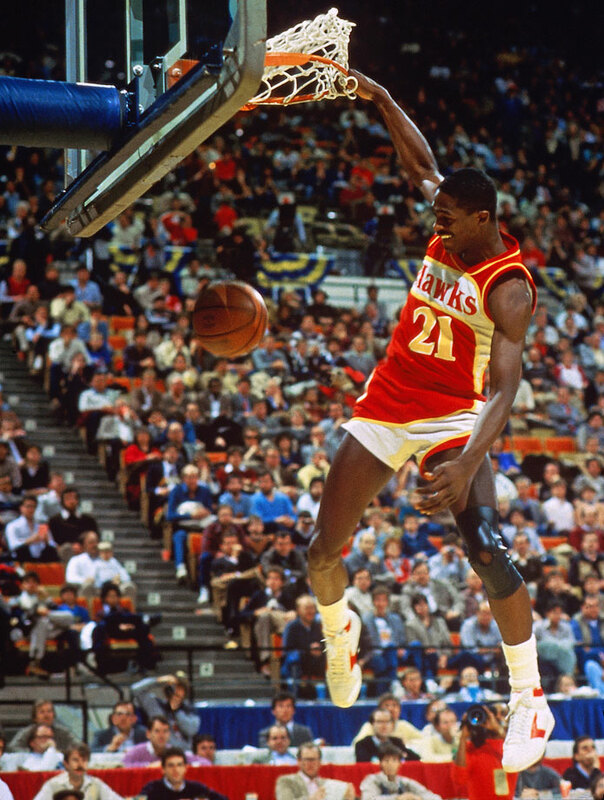 Barry's version of a free-throw line dunk carried him to victory over fellow rookie Michael Finley. 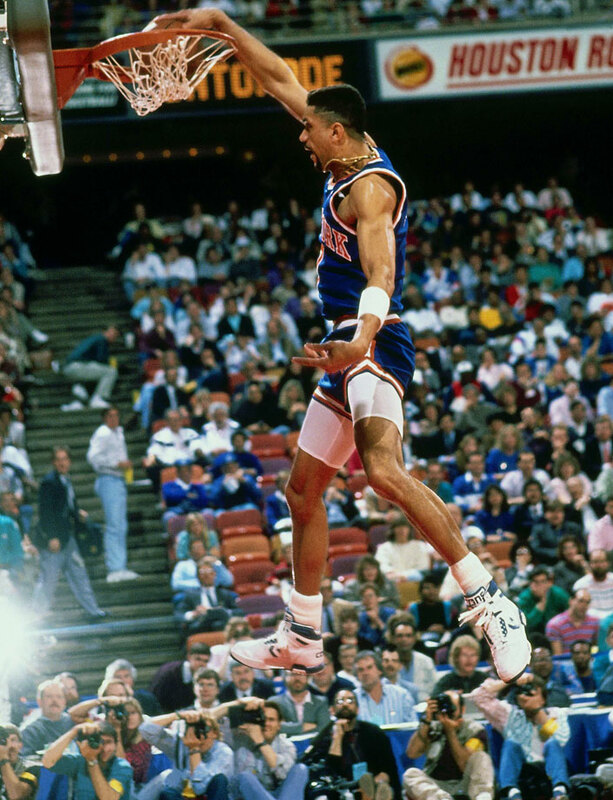 Bryant, 18, who was 5 when Larry Nance won the first dunk contest, claimed the title with a between-the-legs dunk that rivaled Isaiah Rider's. 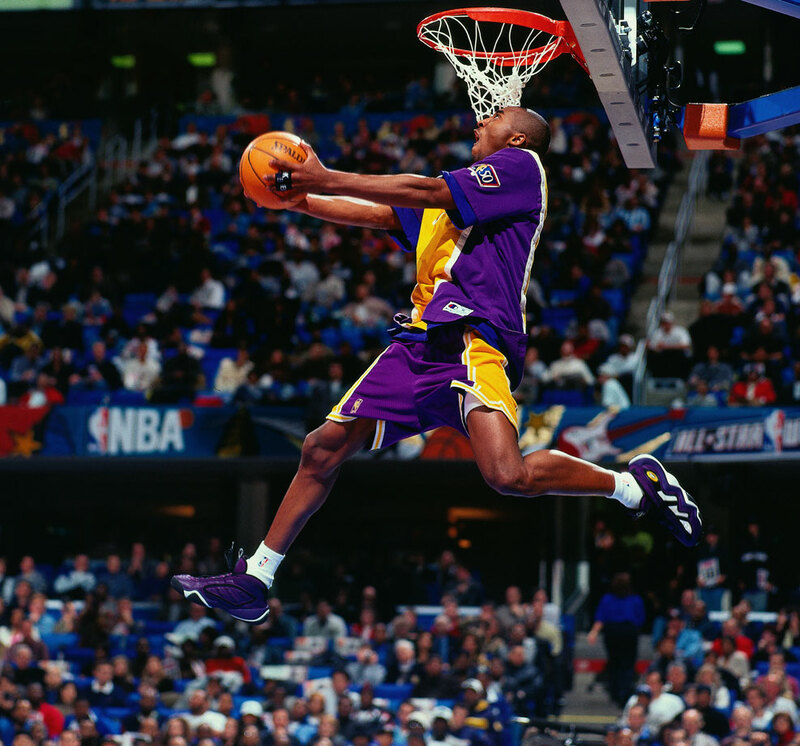 Kobe remained reigning champion for a while: The NBA did not stage the competition in 1998 and All-Star weekend was scrapped in 1999 because of the lockout. 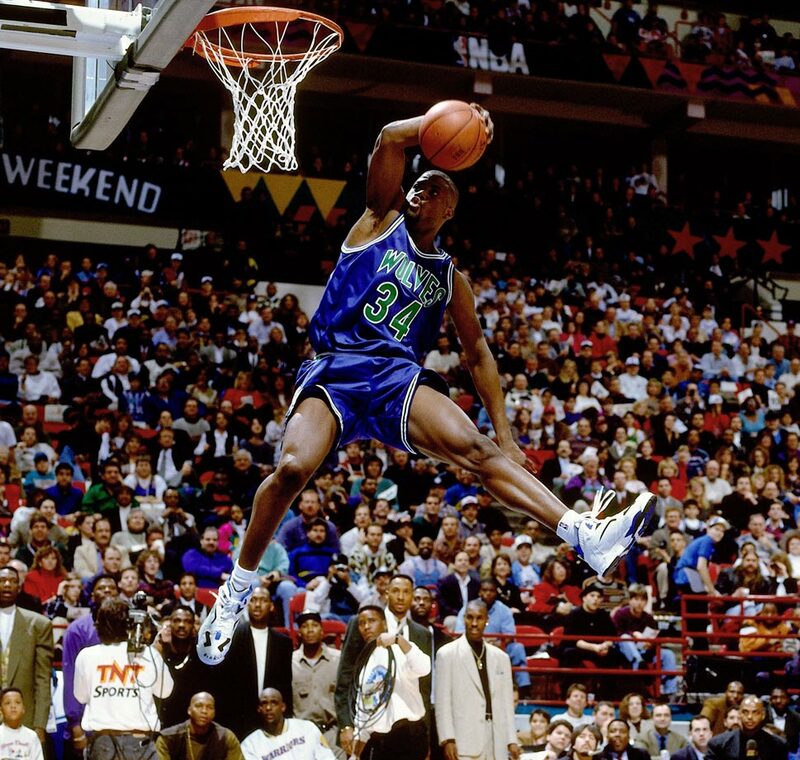 Even all-time greats who have seen a few things were floored by Carter's stunning explosiveness and athleticism. 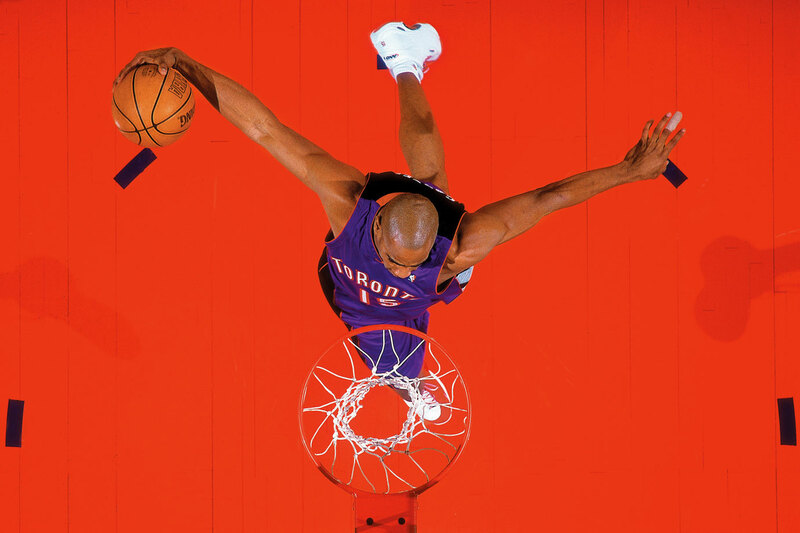 "He was probably more spectacular with two of those dunks than anyone who has ever dunked a basketball," Julius Erving said after Carter blew away Steve Francis and Raptors teammate Tracy McGrady in the finals. Carter himself declared the competition over after his under-the-leg windmill jam in the first round. Mason and the rest of the six-player field had the misfortune of following the act of Vince Carter, who didn't defend his title because of a knee injury. 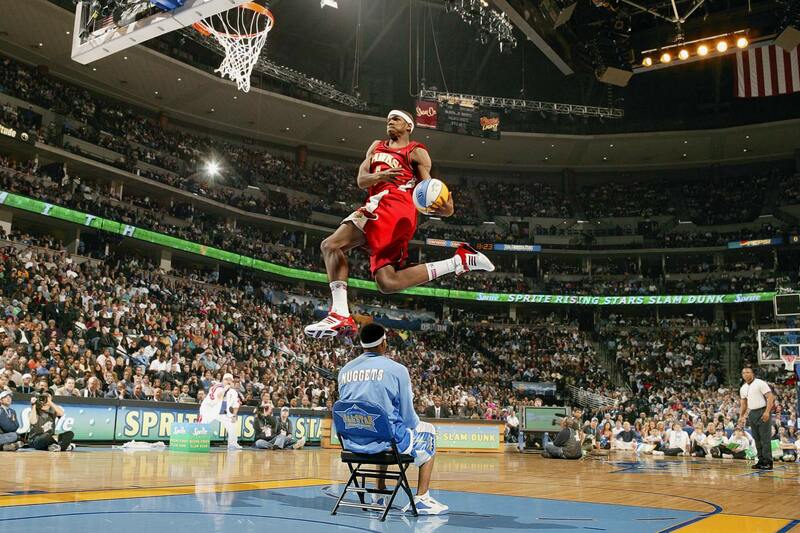 Mason won an underwhelming competition over DeShawn Stevenson and Baron Davis. The field was cut to four and -- in what proved to be an unpopular gimmick -- each player was forced to spin a roulette-type wheel to determine certain dunks. Richardson did a convincing Dominique Wilkins impersonation en route to victory. 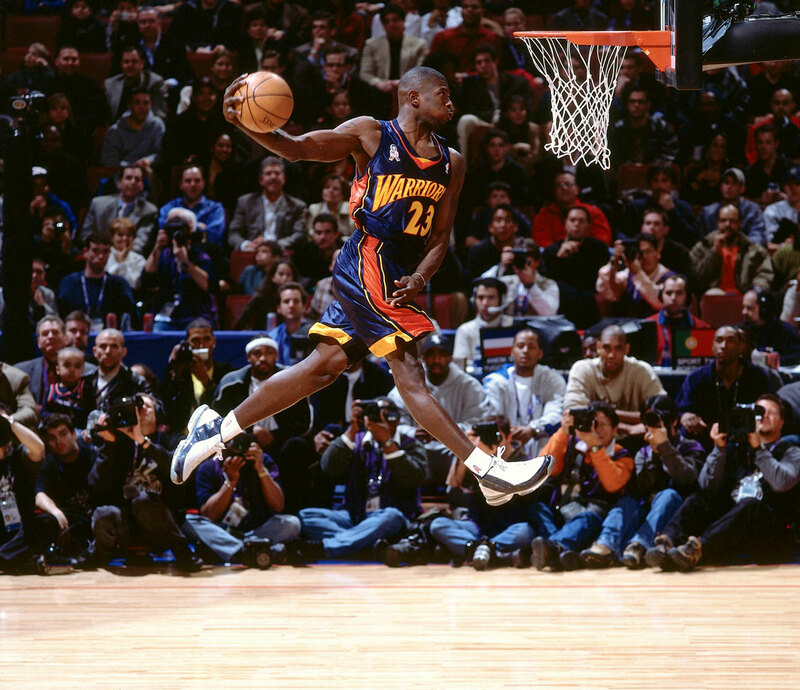 The Warriors' guard beat 2001 champ Desmond Mason to join Michael Jordan as the only back-to-back winners. Needing a 48 on his final attempt to win, Richardson scored a 50 with a between-the-legs, left-handed dunk. Jones prevented second-place finisher Jason Richardson from becoming the first three-time champion. The ending was a dud as both Jones and Richardson missed their final attempts. 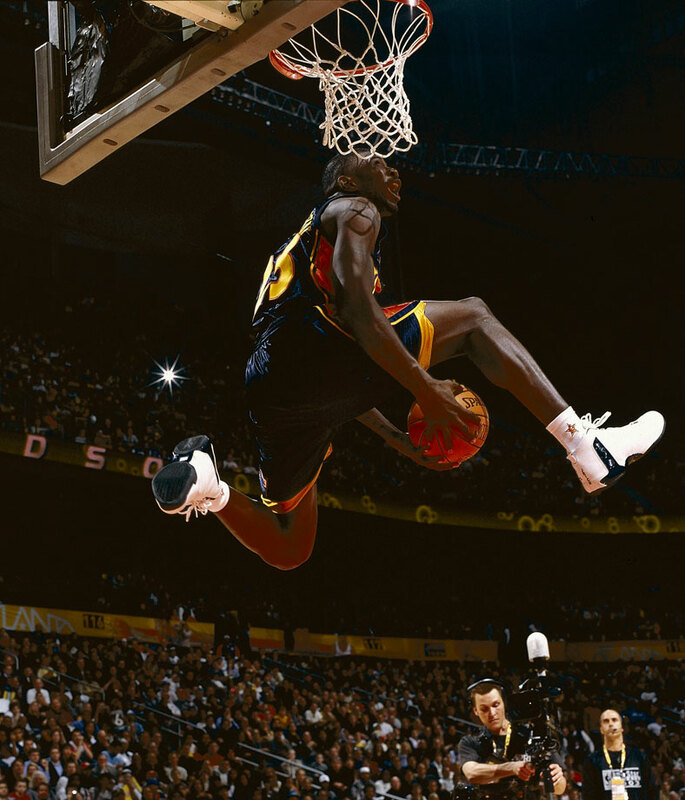 LeBron James flirted with competing but ultimately ceded the stage to Hawks rookie Smith, who scored 50s on both attempts in the finals, including a windmill dunk while wearing Dominique Wilkins' jersey. 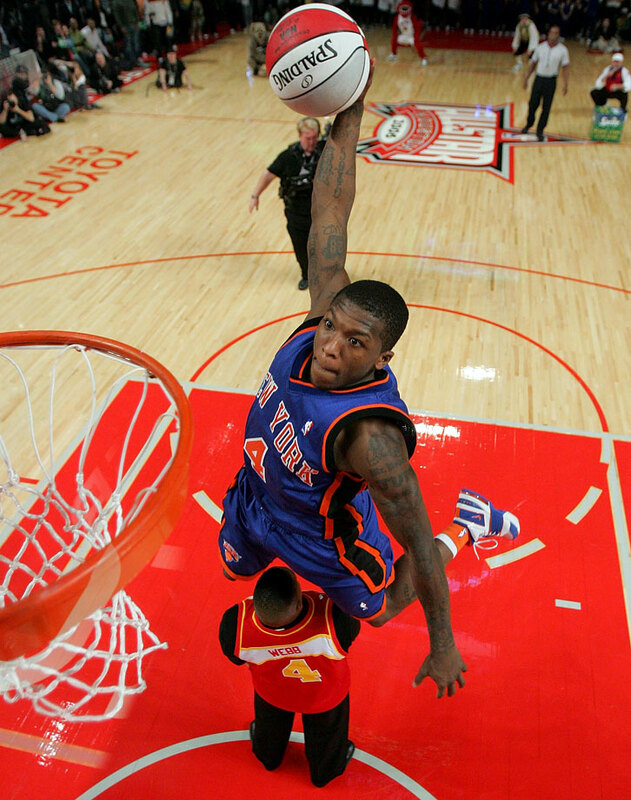 Meanwhile, in the first round, Chris (Birdman) Anderson needed eighth tries to complete a dunk. The 5-foot-9 Knicks guard missed attempt after attempt but defeated Andre Iguodala in a dunk-off for a controversial victory. 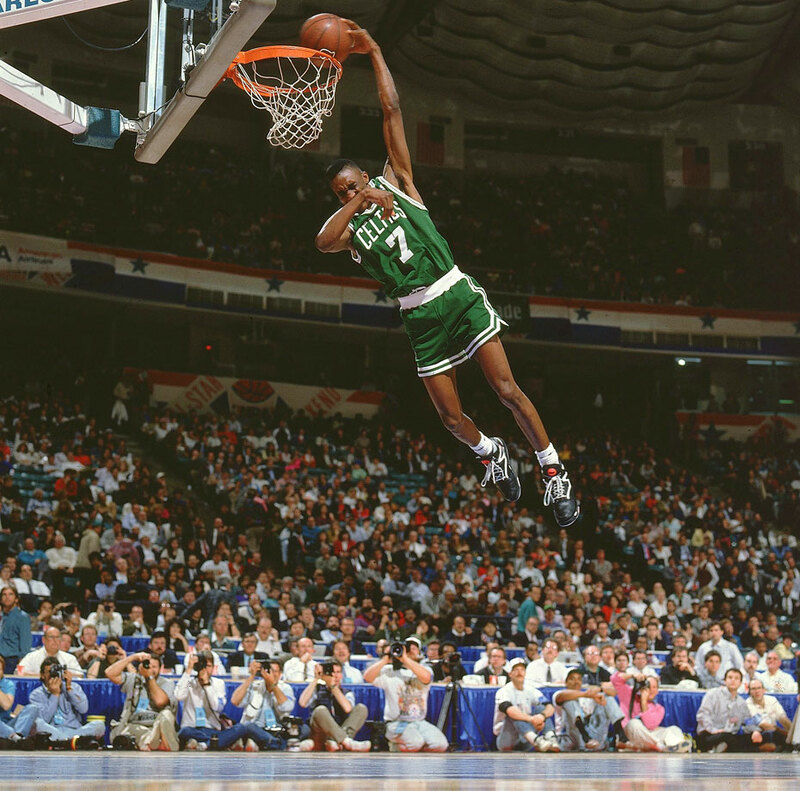 The Boston swingman paid homage to 1991 champion Dee Brown by shielding his eyes during one spectacular dunk. Green first donned Brown's No. 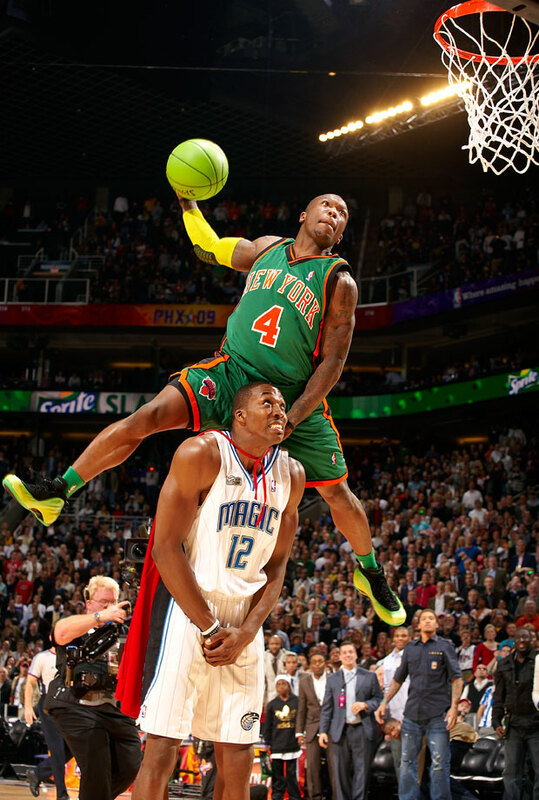 7 Celtics jersey and jumped over fellow competitor Nate Robinson before completing the one-handed jam. 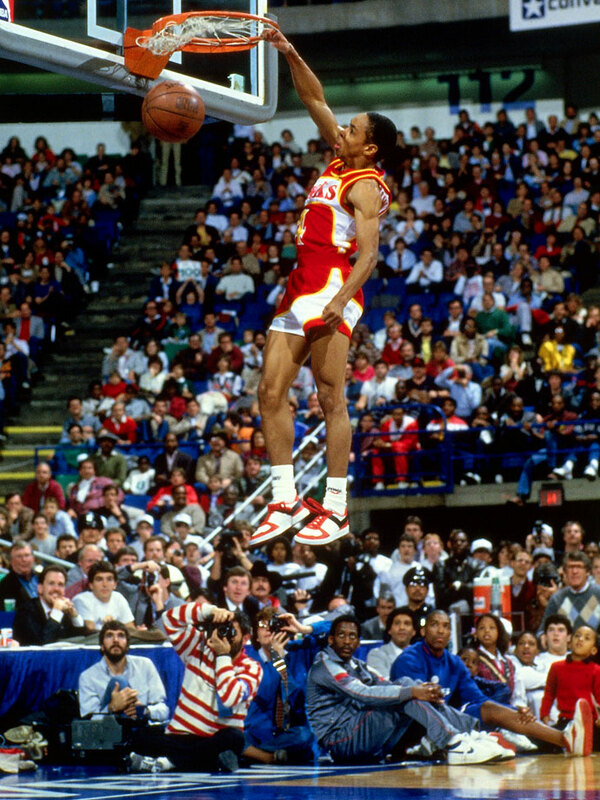 Superman took flight as the 6-foot-11 Howard became the tallest winner in event history. The little man soared highest once again. 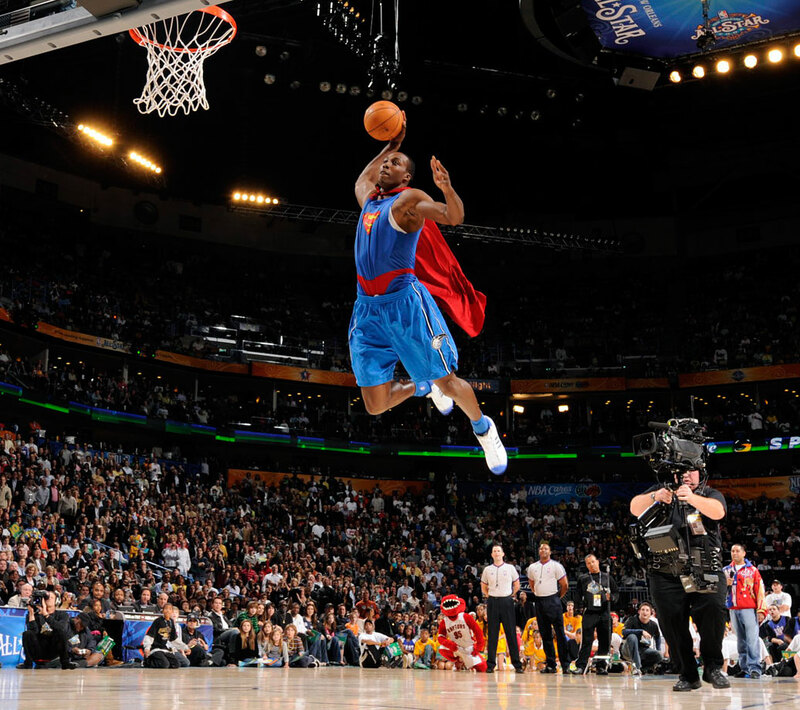 Robinson would cap the night by donning a green uniform (complete with shoes and matching ball) to play the role of "krypto-Nate" to defending champ Dwight Howard's Superman. He become the fifth two-time winner in the contest's history. Make that three. The little man from New York took home his third dunk contest crown, beating out DeMar De Rozan with 51 percent of the votes in the final to become the first three-time winner in the event's history. 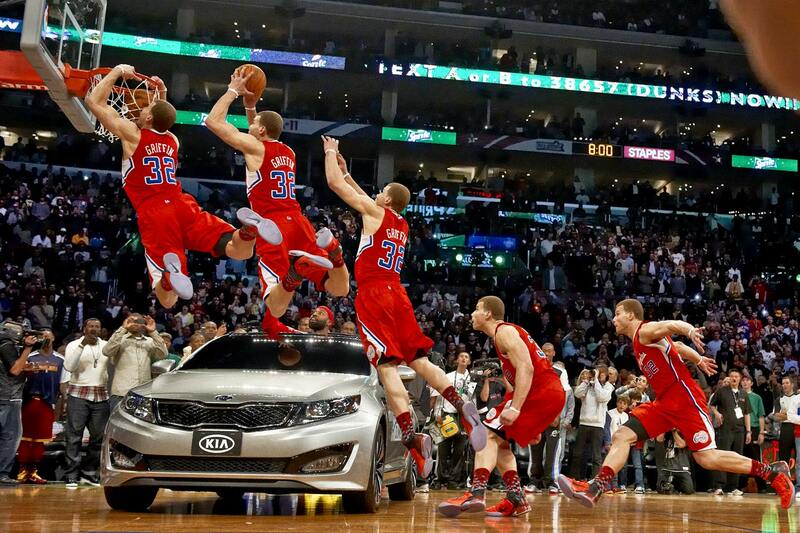 In front of his hometown fans, Blake Griffin lived up to the hype and edged JaVale McGee to win the 2011 slam dunk title. Griffin's final and most impressive dunk of the night came when he jumped over a car and threw down a two-handed slam while a gospel choir sang "I Believe I Can Fly" at halfcourt. The 2012 contest lacked the big names and impressive dunks, but there was no shortage of props. 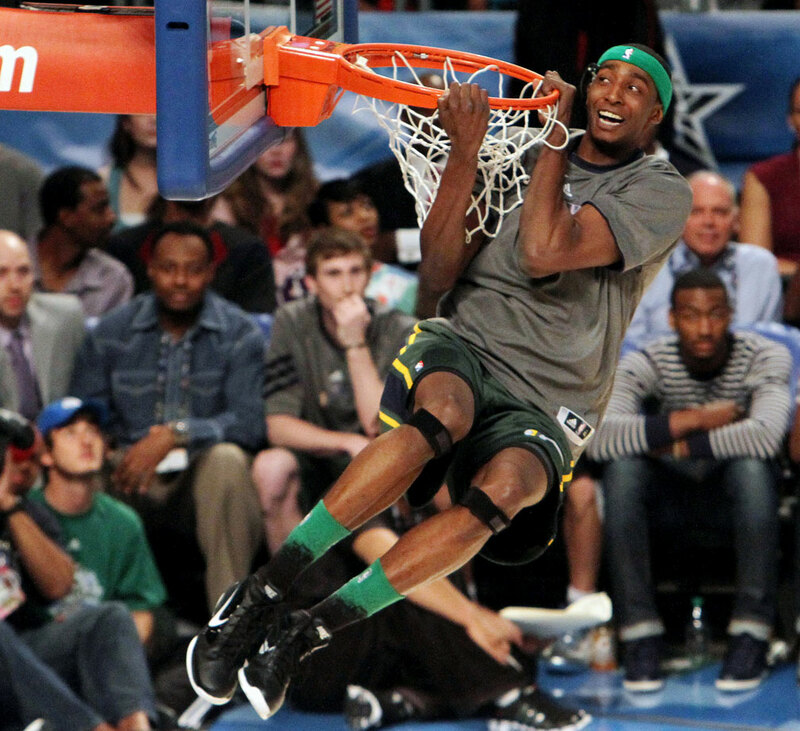 In the end, Utah Jazz forward Jeremy Evans, who was a replacement for the injured Iman Shumpert, won it all. 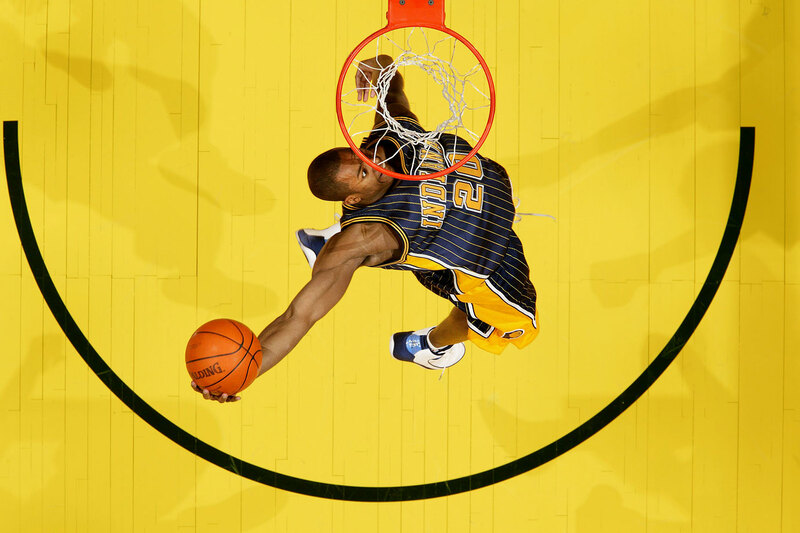 Evans wore an eye camera during his first dunk so viewers could get a rim-level view. In a contest filled with missed dunks, Terrence Ross' consistency reigned supreme. The Raptors' rookie nailed all four of his dunks, including an homage to Raptors great Vince Carter and a between-the-legs dunk over a ball boy, en route to besting defending dunk champ Jeremy Evans. 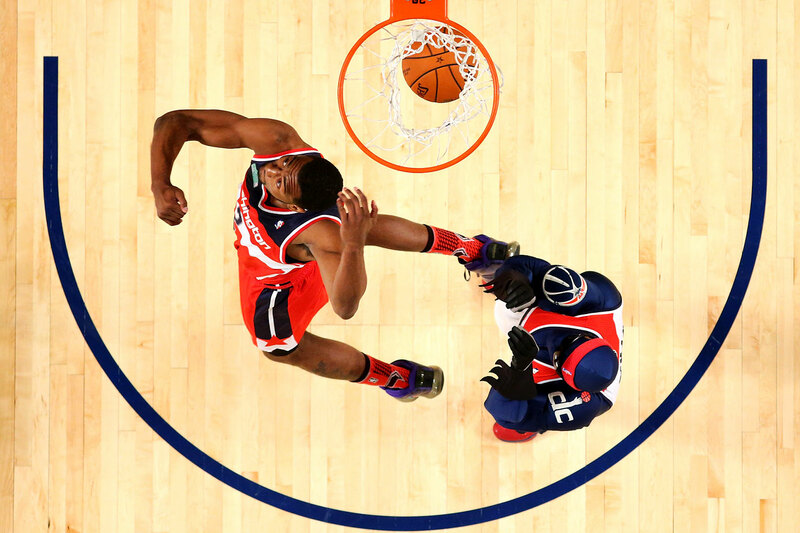 Answering Sacramento rookie Ben McLemore's dunk in which he leaped over Shaquille O'Neal seated in a king's throne, Wall took the ball from Wizards mascot G-Man, who held it above his head, then brought it down between his legs and slammed down a reverse dunk. 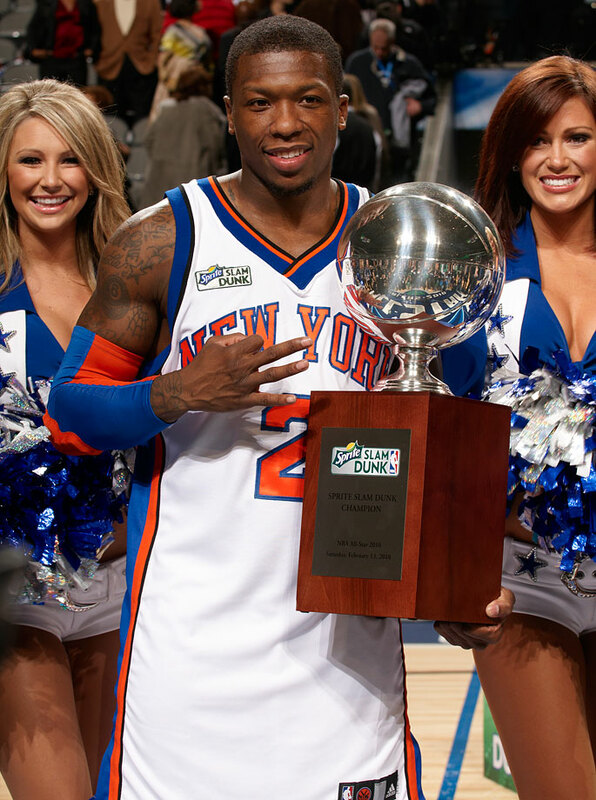 Wall's efforts earned him the slam dunker of the night honor, a title that involved a social media component. LaVine earned a perfect score (50) with his first dunk of the night, an homage to "Space Jam" between-the-legs reverse effort, and brought the crowd to its feet with three other acrobatic dunks. The Timberwolves guard became the second-youngest player to win the contest. Zach LaVine scored a perfect 50 on his first dunk and needed two dunk-offs to outlast Aaron Gordon for a classic victory.